Happy Monday! It's time for a new Mojo Monday sketch. I went summery for my take on the sketch, using stamps and dies from Clear and Simple Stamps. I've been eating lots of peaches this summer (white peaches are my faves! ), so I decided it was time for a peach-themed card. I used the peach images from the Perfect Harvest set and the coordinating dies from the Mini Fruit set to make a pair of pretty peaches. They were adhered to the edge of a white circle, using foam tape on the top peach for dimension. 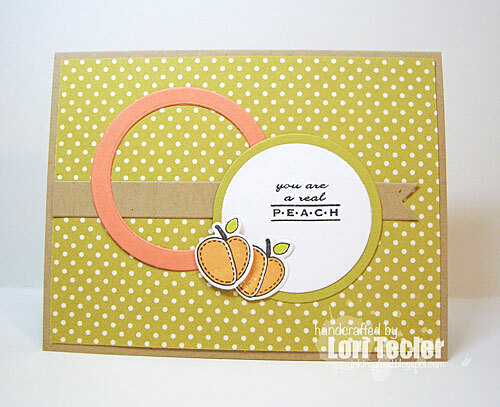 The "you are a real peach" sentiment from the Perfect Harvest Fillers set was stamped on the circle in black ink. I arranged the stamped panel on a green dotted paper panel along with an open circle cut from peach cardstock and a long kraft Favor Flags die cut. The finished panel was adhered to a kraft card base. Head on over to the Mojo Monday blog for more inspiration from the Mojo Makers design team and to add your own take on this week's sketch! What a sweet CAS card! Wonder why I'm craving a peach now - lol! This is so darling, Lori! I just love those little stitched peaches.